Small 4 Style: Edo Popken Galleria Dallas Pop Shop! Edo Popken Galleria Dallas Pop Shop! Menswear designer Edo Popken is bringing his one-of-a-kind European menswear to Galleria Dallas, which is the site for the new Edo Popken of Switzerland popup shop. “The opening of Edo Popken’s popup shop further showcases the center [Galleria Dallas] as a destination for the latest in fashion and style,” said the Galleria Dallas General Manager Angie Freed. Beginning Tuesday, Nov. 25 (tomorrow! ), customers can shop Edo Popken’s upscale menswear collection at the Galleria, just in time for the holidays. Dallas’ District on Dragon Street, which opened in 2013. In Dallas, Popken’s collection of color-blocked polo shirts is the most popular and recognizable product group. From formal men’s suits to daywear, Edo Popken of Switzerland offers a wide array of men’s apparel and accessories. At Monday’s preview event, Popken pointed out some of the unique features on his pieces, like the curve on the edge of a vest to match the curve of a shirt tail. For Popken, every detail matters. The popup had just a few items on the shelves Monday night. But Popken assured guests that it would be fully-stocked and ready for the opening on Nov. 25. According to Popken, the Galleria Dallas popup shop deal was settled last Friday, just a few days before the celebration on last Monday night. The new 3,000-square-foot Edo Popken popup was previously home to luxury menswear boutique Faconnable. “To be on the luxury level between Michael Kors and Coach, [it] could not be any better,” said Popken. The designer, who is a fourth-generation European fashion designer, produces his garments in limited quantities of 111 per style. Each numbered item is made with European fabrics that are custom-made for Popken exclusively. 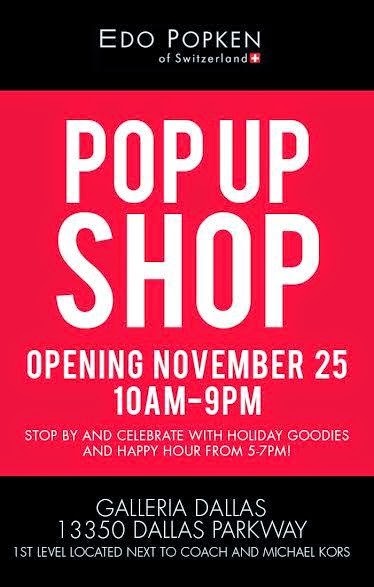 Popken also said he was thrilled to open the popup during the peak holiday shopping season. “I rarely get excited about business, but this one here is wicked,” said Popken of his new Galleria Dallas popup.